While dining out at Trade on Boston’s Atlantic Wharf, we recently sampled a cool and creamy burrata appetizer and were instantly inspired to feature the delectable cheese. For anyone unfamiliar with burrata, it’s a mild, buffalo milk cheese from Puglia, similar to the ever popular fresh mozzarella but filled with cream. It means "buttered" in Italian which is only appropriate when you cut into the outer shell to reveal a creamy, oozy interior. 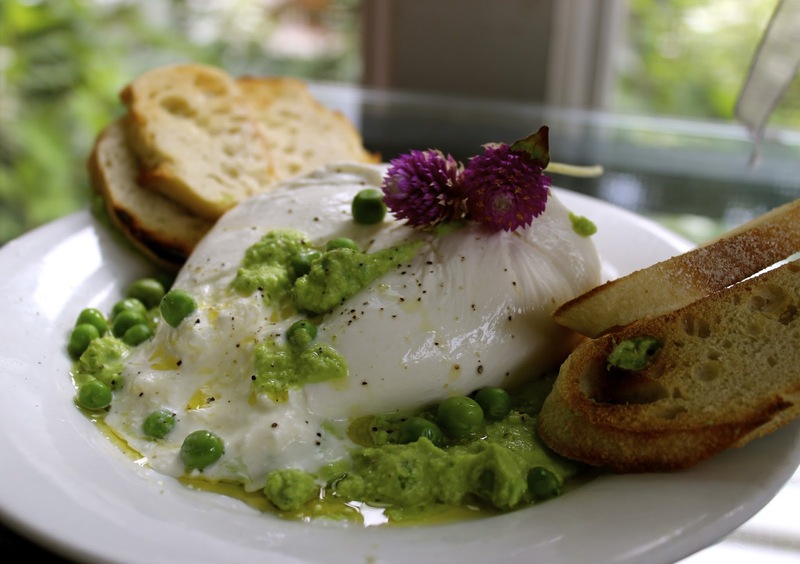 At Trade we enjoyed balls of burrata with a chilled pea puree, and opted to merge these ingredients into a burrata, pea and mint pesto bruschetta. The cascading cheese spread atop toasted baguette slices is the perfect alfresco appetizer. 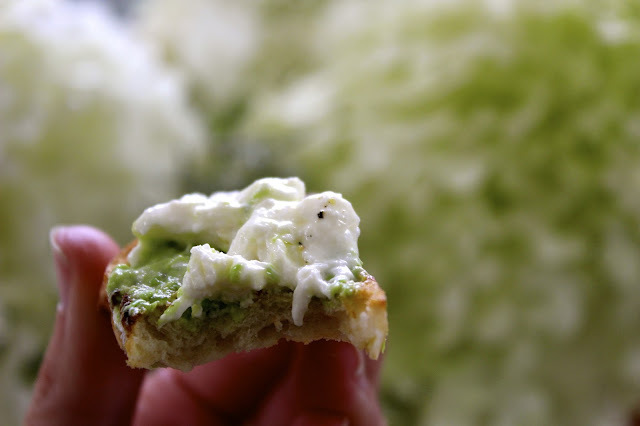 The creamy pool swirls with the vibrant green pesto and the pea polka dots just dance off the platter. Spoon a pool of the pea puree onto a serving place. Top with with the burrata cheese ball. Pour over more pea pesto, a drizzle of EVOO and salt and pepper. Garnish with the 1/4 cup of peas and any flowers you may have in your garden. Serve spread atop the toasted baguette. Serves 6-8. Once you try this rich and creamy cheese, you’ll be fast to revamp a classic Caprese salad or feature it in any summer dish!